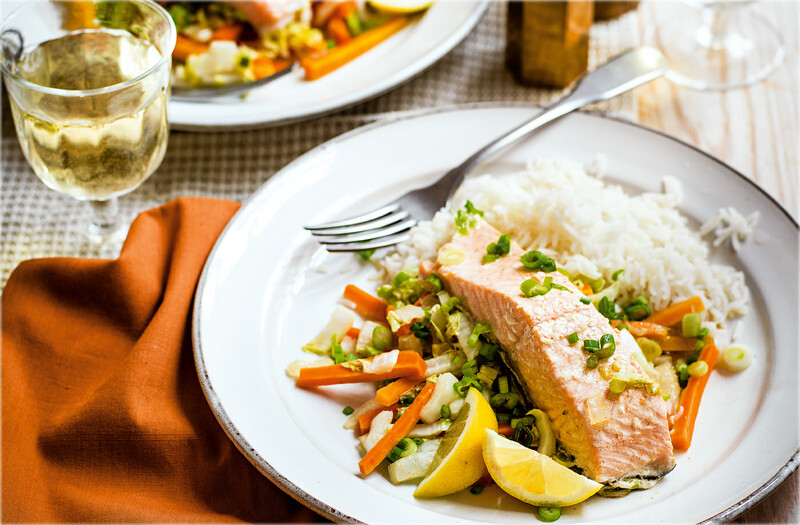 A medley of soy sauce, sherry, ginger and garlic gives these salmon fillets their exquisite flavour. Bake in foil parcels for fish that completely falls apart and serve on a bed of crunchy veggies with a side of rice for a heavenly dinner for two. Preheat the oven to gas 7, 220°C, fan 200°C. Put 2 x 45cm squares of foil on the worktop. Divide the carrot and put in the middle of the squares, followed by the Chinese leaf and half the spring onions. Put a salmon fillet on top of each. Mix the soy sauce, sherry, ginger and garlic, then spoon over. Wrap each foil square tightly into a parcel, put on a baking tray and bake in the oven for 20 mins. Meanwhile, cook the rice following the pack instructions then drain well. Remove the foil and serve the contents of each parcel with the rice; garnish with the remaining spring onions. Tip: You’ll need extra-wide 450mm foil for this recipe.